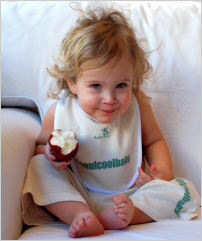 Thula Mama babywear is made using 100% organic cotton. Certified organic cotton is grown using methods and materials that have a low impact on the environment. Organic production systems replenish and maintain soil fertility, reduce the use of toxic pesticides and fertilizers to build a biologically diverse agriculture. Third party certification verifies that organic producers use only methods and materials allowed in organic production. A babies skin is estimated to absorb 60% of the substances it comes into contact with. 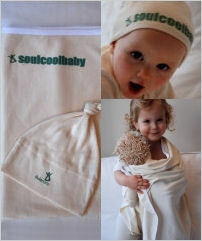 Organic cotton is therefore healthier, particularly if a baby has sensitive skin or allergies. Organic agriculture minimizes children's exposure to toxic chemicals in soil in which they play, air they breathe, water they drink, foods they eat and the clothes they wear. Pesticides pose special concerns to children because of their high metabolisms and low body weights. The Farm workers involved in the production of these garments are not exposed to the hazardous pesticides and insecticides usually associated with cotton production that can cause health problems. Pesticide and fertilizer use on regular cotton crops are linked to the pollution of our rivers, lakes and oceans. Buying one organic cotton t-shirt saves approx. 200grams of these toxic chemicals. These garments were manufactured in a sweatshop free factory. Thank you for choosing this organic product that will not only be good for the baby you love, but also help preserve our planet.